We are a loving Christian based family who love Labrador Retrievers. My family is located in the southwest corner of Tennessee outside of Memphis. I plan 1 to 3 litters per year strictly for the love of this magnificent breed. All of our dogs are English in style ( stocky, heavy boned dogs with a nice thick coat, square heads, otter tails with that sweet laid back temperament ) 1st and foremost our puppies make great family companions & hunting partners. All Spencer's Labs are pets first and show dogs second, I strive for quality puppies NOT quantity. I like to keep my program small so that each and every dog gets the attention they deserve. I do not have a kennel facility, all of our dogs are raised in the home with us. While most our litters are registered with American Kennel Club and United Kennel Club our prices vary pending what we put into the breeding's . My daughter and I love to travel to compete in conformation shows and have recently obtained our very first bred by champion in October 2013 & Have added many more Champion and Grand Champion titles since- We have been bitten by the show bug and are always planning ahead for more. Spencer's Labs are sold as beautiful pet quality Labradors with the fabulous look that will stop you in your tracks. We strive to produce the very best puppies according to the breed standard with each and every litter being better than the last. I would like to mention that winning ribbons and awards for our dogs is very humbling and YES we strive for more of that but being BEST IN SHOW isn't everything, BEST IN HOME is equally as important. 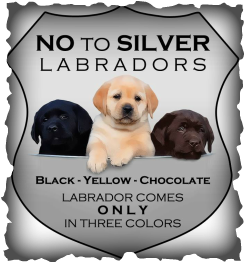 We choose to breed True Labradors in Yellow, Black , & Chocolate coats - We DO NOT SUPPORT DILUTES. !